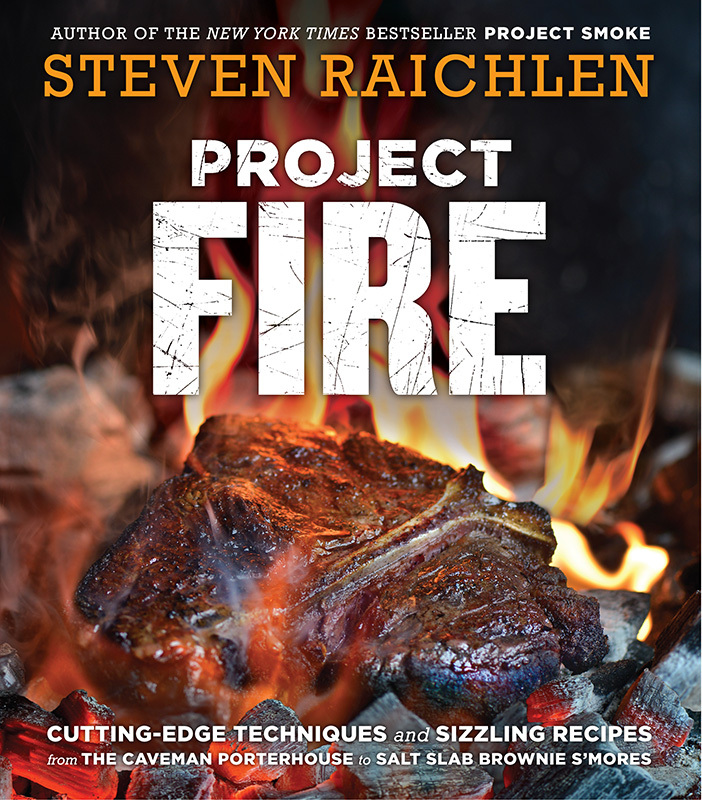 Chappy’s very own grilling expert, Steven Raichlen, has a new PBS program, “Steven Raichlen’s Project Fire,” and he’s published his 31st book, “Project Fire: Cutting-Edge Techniques and Sizzling Recipes from the Caveman Porterhouse to Salt Slab Brownie S’Mores.” The Times caught up with Raichlen in Seattle, where he was out on the road promoting the new book. Raichlen said he first came to the Vineyard with his wife 25 years ago on a trip to celebrate their anniversary. “We looked at property on a lark, and bought a piece of land on Chappy,” Raichlen said. That was in the late 1990s, and they built their home there in 2001. The former restaurant critic for Boston magazine said he typically spends May to October on Chappy, and that’s where he tries out many of the recipes for his cookbooks. The rest of the year he’s based in Miami. One of Raichlen’s favorite things to grill up when he’s here is harpooned swordfish. 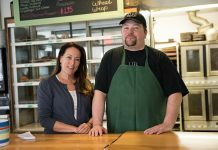 Raichlen’s passion for all things grilled and barbecued wasn’t something that began when he was growing up. 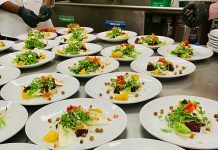 In fact, it wasn’t until he was awarded a Thomas J. Watson Fellowship during his senior year at Oregon’s Reed College (he was a French literature major) that he truly began to consider the connection between food, history, and culture. The fellowship included researching and traveling around Europe; that’s how he came across a medieval cookbook. “I came to realize what I wanted to do was to explore the intersection of food, history, and culture,” Raichlen explained. Ever since man first discovered fire, he’s been grilling, he said. “We’re the only animal that cooks, and our human ancestor, homo erectus, 1.8 million years ago discovered you could cook meat with fire,” Raichlen said. “It’s probably the most important discovery in human history.” This made meat easier to metabolize, he said, then you see the human brain getting larger and the jaw size getting smaller. There are numerous grilling methods these days, and many types of grills for sale. “Project Fire” isn’t just a book full of recipes (although it is filled with many — including breakfast on the grill, Bacon Grilled Onion Rings, Grilled Sangria, and my personal favorite, Wood-Grilled Swordfish with Butter-Fried Olives), it’s a book that walks you through which grill is right for you, what type of fuel to use, what kinds of tools you need, and much more. Nowadays, Raichlen said, people cook just about everything on the grill. He and his wife particularly enjoy cooking veggies on the grill. “My wife and I both like to eat veggies a lot; my wife has strong vegetarian leanings,” he said. “One of best ways to cook vegetables is on the grill. 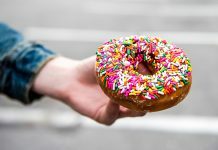 It brings out the natural sweetness.” When they stay on Chappy, it’s fresh locally grown corn, carrots, and kale from either Morning Glory or Slip Away Farm, local seafood, and chickens from the GOOD Farm. Arrange the swordfish steaks in a nonreactive baking dish. Generously season the swordfish on both sides with salt and pepper. Squeeze the juice of 1 lemon over the fish on both sides. (Squeeze it through your fingers to catch the seeds.) Drizzle olive oil on both sides, patting it and the seasonings into the meat with the back of a fork. Marinate the fish in the refrigerator for 20 minutes while you light the fire and make the sauce. Make the butter-fried olives: Melt the butter in a skillet over medium-high heat. Add the olives or capers and fry until crisp, 2 to 4 minutes. Set aside and keep warm. Set up your grill for direct grilling, and heat to high. Ideally, you’ll grill over wood, or at least add wood chunks or chips to the coals (or place on the heat diffuser or in the smoker box of your gas grill.) Brush or scrape the grill grate clean and oil it well. Drain the swordfish, reserving the marinade. Arrange the steaks on the grate (all should run in the same direction — slightly on the diagonal to the bars of the grate.) Grill until cooked through, about 4 minutes per side, giving each steak a quarter-turn after 2 minutes to lay on a crosshatch of grill marks. When you invert the fish, pour the reserve marinade over the steaks. While you’re at it, grill the remaining four lemon halves. There are two ways to test for doneness. The first is the “poke” test: Press the fish with your index finger. If it feels firm and starts to break into clean flakes, it’s cooked. Alternatively, insert an instant-read thermometer through the side of one of the steaks. The internal temperature should be about 140°F. Transfer the swordfish to a platter or plates. Rewarm the olive butter, and pour it over the fish. Serve the grilled lemon halves for squeezing on the side. Set up your grill for indirect grilling, and heat to medium high. Arrange the carrots in a single layer in a large disposable aluminum foil pan. Drizzle with olive oil, and season generously with salt and pepper. Place the carrots in the foil pan on the grill grate, away from direct heat. Add wood chunks or chips to the coals. Close the grill lid. Smoke-roast the carrots until almost tender, 30 to 40 minutes. Move the carrots (still in the pan) directly over the fire and grill until the exteriors are darkly browned and crusty, 5 to 10 minutes, turning with tongs to ensure even browning. Arrange the carrots on a platter or plates. Spoon the spice-scented yogurt over them and sprinkle with thyme, if using. Heat a dry cast-iron skillet over medium-high heat. Add the cumin and coriander seeds and roast until fragrant and lightly browned, 1 minute, stirring with a wooden spoon. Lightly crush the roasted spices with a pestle or the back of a smaller frying pan to crack the coriander seeds. Place the yogurt in a bowl and stir in the toasted spices, hot red pepper flakes, lemon zest, olive oil, and salt and pepper to taste. The yogurt should be highly seasoned.